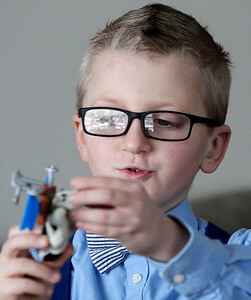 Matthew Apgar - mapgar@shawmedia.com Jasper Damiano of Harvard, 6, plays with a toy in the living room of his family's home on Tuesday, March 01, 2016 in Harvard. Damiano had free bilateral otoplasty surgery on his prominent left ear at the University of Chicago Comer Children's Hospital through the Fresh Start Surgical Gifts program. 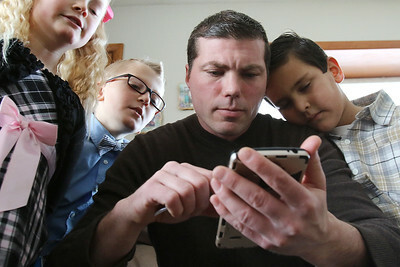 Matthew Apgar - mapgar@shawmedia.com Nicholas Damiano of Harvard sits on a chair surrounded by his children (from left:) Sapphire, Jasper, both 6, and Jett, 5, on Tuesday, March 01, 2016 as they look at photos on his smartphone of Jasper before and after surgery. 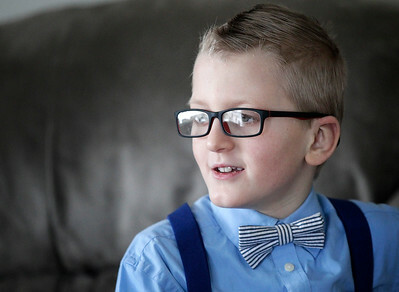 Jasper had free bilateral otoplasty surgery on his prominent left ear at the University of Chicago Comer Children's Hospital through the Fresh Start Surgical Gifts program. Matthew Apgar - mapgar@shawmedia.com Jasper Damiano of Harvard, 6, touches the back of his left ear on Tuesday, March 01, 2016 in Harvard. 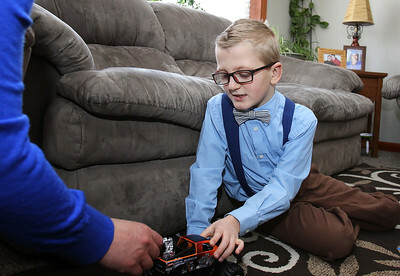 Damiano had free bilateral otoplasty surgery on his prominent left ear at the University of Chicago Comer Children's Hospital through the Fresh Start Surgical Gifts program. 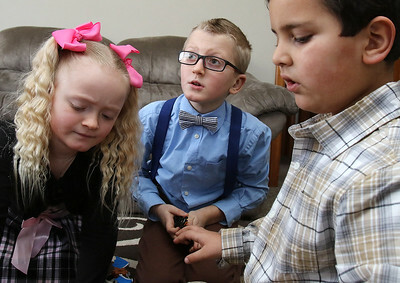 Matthew Apgar - mapgar@shawmedia.com Jasper Damiano of Harvard, center, plays with his twin sister Sapphire, both 6, left, and Jett, 5, on Tuesday, March 01, 2016 in Harvard. 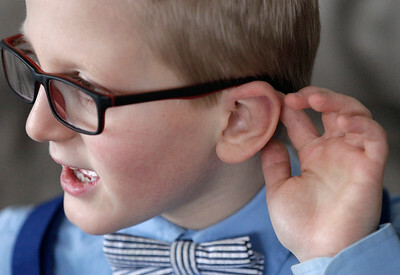 Jasper had free bilateral otoplasty surgery on his prominent left ear at the University of Chicago Comer Children's Hospital through the Fresh Start Surgical Gifts program. Matthew Apgar - mapgar@shawmedia.com Jasper Damiano of Harvard, 6, talks with his parents at home on Tuesday, March 01, 2016 in Harvard. Damiano had free bilateral otoplasty surgery on his prominent left ear at the University of Chicago Comer Children's Hospital through the Fresh Start Surgical Gifts program. Matthew Apgar - mapgar@shawmedia.com Jasper Damiano of Harvard, 6, plays with his mother at home on Tuesday, March 01, 2016 in Harvard. Damiano had free bilateral otoplasty surgery on a prominent ear at the University of Chicago Comer Children's Hospital through the Fresh Start Surgical Gifts program. Jasper Damiano of Harvard, 6, plays with a toy in the living room of his family's home on Tuesday, March 01, 2016 in Harvard. Damiano had free bilateral otoplasty surgery on his prominent left ear at the University of Chicago Comer Children's Hospital through the Fresh Start Surgical Gifts program.